At this level of the castle, which covers part of the main building with a small yard, west and east tower, are decorated the great halls of the social and ceremonial character. At the turn of the century hunting was favorite entertainment among the nobility. 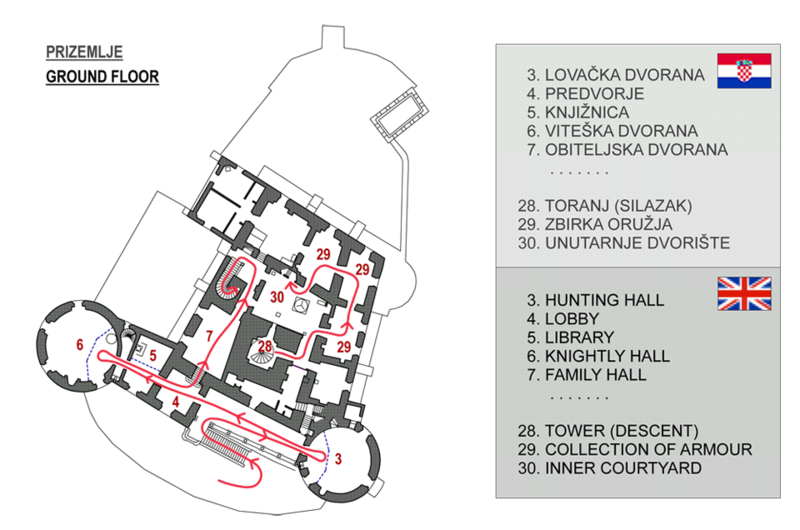 In the east tower of the castle is situated hall that symbolizes the hunting tradition of Draskovic. That was the former great dining. Here used to stay an male company on returning from hunting. The interior is richly decorated and adorned with hunting trophies: antlers deer from the surrounding forests, deer head, griffon vulture, etc. It should be noted an big white stove decorated with hunting motifs. The most important museum objects exhibited in lobby is definitely a big Draskovic genealogy. This impressive large sized painting was created in 1668th, based on the information in his book on the history of the Draskovic family brings Francis Ladanyi, director of Croatian family possessions and goods, from the 1650th up to 1680 year. The figure shows a branching tree that grows from Ivan Draskovic - legendary ancestor of the family, and that in a suit of armor lying on the ground. In addition to the tree in the landscape is shown Trakošćan. It is the oldest surviving image of the city, which is especially valuable because it is a representation of the actual layout, not the stereotypical views. The workspace is furnished with mobiliary and bookshelves neo-Renaissance style. Overall royal library now has about 1,700 books, and the content is encyclopedic and are mostly fiction releases second half of 18th and the entire 19th century books were written mostly in German and French language. The smaller cabinet is an archaeological collection from the legacy of Draskovic. In the western tower of the castle is situated the most representative part of the castle - the Knights' Hall. The festive space renovated in the 19th century, seeks to bring us back to medieval romantic past and evoke the virtues of chivalry. Today symbolizes military and defense past of Trakoscan and Draskovic family, whose many members distinguished themselves in the wars against the Ottoman Empire, and later in fighting the other European fronts. Space is gothicized vaulted, decorated weapons that originated from 15th 17th century, portraits of generals and décor made of wood (19th century). The central place occupied by two complete equestrian knight armor, and once the area is well covered in bas-relief. Hall with exposed portraits of the first members of the family Draskovic. Certainly here to highlight portraits of three brothers: John, Gaspar and Juraj Draskovic. In addition to portraits of family members Draskovic here is a small family genealogy. It is a display of family tree that brings us interesting information about the layout of Trakoscan and his crew on mid 18th century. In the central part of the building is situated a yard with a rectangular shaped tank, with the lower part of the stone belongs to 17th century, while the upper set of cast iron in the 19th century. Two floors north wall of the courtyard in the baroque period, was open double semicircular arcades whose remains can still be seen in the interior. Through the eastern and southern walls of the two-level stretch balconies, furnaces and stoves trophies of deer antlers. In the wall of the courtyard is a clock with dual dial, work of Varaždin watchmaker J. Bechela (19th century).